A new federal overtime rule took effect on December 1, 2016, but a Texas district court issued an injunction and the Department of Labor (DOL) was prohibited from implementing and enforcing it. This rule increased the salary level that determines when employees make enough that they can be denied pay for the overtime hours they work. By raising the threshold from $23,660 annually to $47,476 annually, the rule would have directly benefited 12.5 million salaried workers, affecting the lives and livelihoods of modest wage earners in all states. On August 31, 2017, a district court in Texas determined that the rule was invalid. This report explains how the threat to the 2016 overtime rule under the banner of “deregulation” affects the states and what states can do to provide certainty to their citizens that overtime rights will be protected. The bottom line: while states should advocate for a strong federal salary threshold, the most direct way states can provide fairer pay to low-wage workers, and reduce overwork, is to adopt their own versions of the 2016 federal overtime rule. Specifically, the rule expanded the basic rights of the federal Fair Labor Standards Act (FLSA): that workers in the U.S. be paid at least a minimum wage (currently $7.25 per hour) and that most workers, when they work more than 40 hours in a week, be paid overtime at a rate of time and a half (1.5 times their regular rate of pay). The FLSA—and the typical state law modeled after the FLSA—has a set of tests, known as the “white collar exemption,” that exempt certain employees from coverage on the theory that they have high enough salaries, important enough responsibilities, and enough bargaining power with their employers to make the legal protections of overtime pay and the minimum wage unnecessary. To meet the requirement for this exemption under federal law, an employer must show that an employee meets three criteria or “tests.” One, the employee must be paid on a salary basis (hourly workers are automatically covered and cannot be exempt). Two, the employee must be paid above a certain weekly salary threshold (though this weekly threshold is often converted to its annual equivalent in news articles and other documents). And three, the employee must perform primary duties that are considered either “executive” (in terms of having managerial duties such as hiring, firing, and supervising), “administrative” (having authority over work directly related to general business operations), or “professional” (performing work requiring advanced knowledge in a specialized field).5 Employees must meet all three of these tests to be exempt under the white collar exemption, so while workers who earn above the salary threshold may be either exempt or nonexempt, almost all workers who earn below the salary threshold are guaranteed the right to overtime pay. Because it is more clear-cut than the “white collar duties” test, altering the salary threshold is a straightforward way to raise wages for modest-earning employees and ensure they are not overworked. 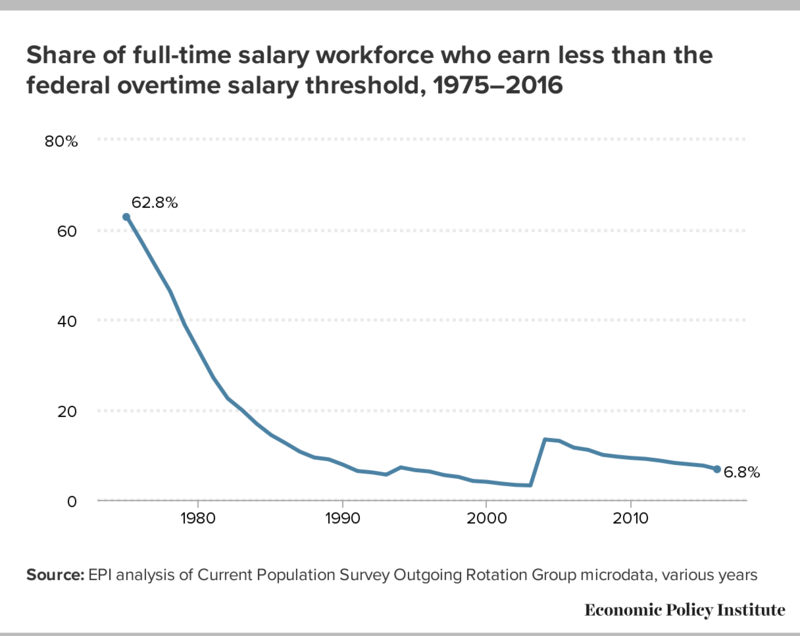 As Figure A shows, in 1975, more than 60 percent of full-time salaried workers were under the salary threshold and hence automatically eligible for overtime. By 2016, the share had dropped to less than 7 percent. The May 2016 federal overtime rule would have partially restored that share to 33 percent by setting the threshold to the 40th percentile of weekly full-time earnings in the lowest-earning census region, the South. Using data from the fourth quarter of 2015, this translated to $913 weekly, or $47,476 annually, for a full-time, full-year worker. The updated threshold more closely tracks a level of salary that would reasonably be paid to a managerial, administrative, or professional worker today. Another important provision of the rule was an automatic update to the threshold every three years, ensuring that the 40th percentile standard laid out in the rule would be preserved and not erode over time with inflation. As Figure B shows, this new rule would have benefited working people in every state. In some states the threshold would have doubled, tripled, or even quadrupled the share of salaried workers automatically eligible for overtime protection by virtue of their modest salary. In South Carolina, for example, 30.3 percent of the salaried workforce—219,000 people—would have benefited from the new rule, bringing the total share of the salaried workforce covered under the new threshold from 9.6 percent to 39.9 percent. In Texas, over 1.2 million people would have directly benefited—25.4 percent of the state’s salaried workforce (raising the share of salaried workers covered from 11.2 percent to 36.6 percent). Note: The estimates consider all the workers who would for the first time be automatically eligible for overtime protection because their salary falls under the salary threshold (i.e., their employers could no longer exempt them from protection by claiming their primary job duties are managerial, administrative, or professional in nature). Not included are a subset of salaried California and New York workers already covered by state thresholds higher than the old federal threshold. Of the major industries most negatively affected by reversion to the old threshold—that is, those industries having the largest shares of salaried workers who would have directly benefited from the increase in the overtime threshold­—are agriculture, forestry, fishing, and hunting (39.7 percent); leisure and hospitality (37.3 percent); other services (33.2 percent); construction (32.6 percent); and public administration (32.5 percent). Occupations hardest hit (having the largest shares of salaried workers who would have directly benefited) are office and administrative support occupations (46.0 percent); transportation and material moving occupations (40.4 percent); farming, fishing, and forestry occupations (40.2 percent); construction and extraction occupations (38.9 percent); and service occupations (38.0 percent). Given the ongoing legal limbo around the 2016 threshold increase, employees in most states making as little as $23,660 a year who are classified by their employer as professionals, administrators, or executives—for example, an assistant manager at a fast-food restaurant—can be forced to work 60–70 hours a week for no more pay than if they worked 40 hours. What do these workers, and the states they live in, stand to lose? Fairer pay for low-wage workers. Without having to pay overtime for exempt employees, extra work hours are completely free to the employer, so they can schedule 10, 20, or 30 additional hours without restraint, which lowers workers’ hourly pay rates substantially, in some cases even to below the minimum wage. Under the updated rule, affected workers who work more than 40 hours a week would get more money, either through overtime pay or through increased salaries to meet the new threshold. Better work-life balance. Under the updated rule, employers who don’t want to pay affected workers for working more than 40 hours a week would need to stop scheduling them for overtime work, effectively ensuring time off from work to handle family responsibilities or engage in other pursuits. More jobs. By reducing overwork, raising the overtime threshold could expand employment. Under the rule, employers in some cases would hire new workers to cover the hours that newly overtime-eligible workers had been working without pay, or spread hours to other employees. Spreading work was a major goal for implementing overtime protections in the FLSA in the first place. By taking action to update standards on overtime pay, states can restore these protections to their residents and lay the groundwork for renewed protections at the federal level. There are several actions states can take to strengthen overtime protections. Help draft and promote state legislation providing the protections that the 2016 federal overtime rule would have provided to workers. The strongest action states could take at this moment would be to pass legislation raising the state overtime threshold, following the parameters of the 2016 federal overtime rule. Even in states where passage of such a law would be difficult, introducing it and seeking public hearings or staging press conferences would raise awareness and could help create a constituency to advocate for better protections for overworked low- and moderate-wage workers. Start a ballot initiative so that voters can weigh in to provide the protections that the 2016 federal overtime rule would have provided to workers. In states that are amenable to ballot initiative campaigns, groups could place an initiative on the ballot to raise the state’s overtime threshold to provide more low- and moderate-wage workers with overtime pay. Support executive action. In some states, the overtime salary threshold may be changed through an administrative regulation. Working with the governor and/or state department of labor could be a good way to obtain an administrative change, if this is an available option and the local political climate is conducive to such a change. California has long implemented legislation raising the salary threshold for overtime pay above the outdated federal standard, and in 2016 New York issued an administrative regulation raising its overtime salary threshold.10 Other states should follow their lead and work to return the certainty of overtime pay to working people. This research was made possible in part by a grant from the Bauman Foundation. The statements made and views expressed are solely the responsibility of the authors. The EARN staff at EPI and the network of state EARN affiliates are available to support organizations and officials who are contemplating action on overtime policy. The Economic Policy Institute has a broad array of policy, data, and legal resources, as well as social media and communications assets that can support state efforts on this and other economic issues. Please contact us at earn@epi.org for further information. 1. U.S. Department of Labor Wage and Hour Division, “Defining and Delimiting the Exemptions for Executive, Administrative, Professional, Outside Sales and Computer Employees,” 29 CFR 541. In November 2016, the United States District Court for the Eastern District of Texas, Sherman Division, issued a preliminary nationwide injunction blocking the rule from taking effect. In December 2016 the Department of Justice, on behalf of the Department of Labor, filed a notice with the U.S. Circuit Court of Appeals for the Fifth Circuit to appeal the preliminary injunction. In August 2017, the United States District Court for the Eastern District of Texas issued a final ruling concluding that the overtime rule was invalid, rendering Justice’s 2016 appeal moot. On October 30, 2017, the Department of Justice, on behalf of the Department of Labor, filed a notice to appeal the judge’s decision as part of a process under which the Trump administration DOL will undertake its own rulemaking to determine a new salary threshold (see “Department of Labor Provides Update on Overtime,” news release, United States Department of Labor, October 30, 2017). 2. For the Trump administration’s stance on the overtime rule, see Ronald Klain, “An Issue Democrats Can Love: Overtime,” Washington Post, September 3, 2017, and Heidi Shierholz, “The Trump Administration Is Trying to Take Away the Rights of Millions of Americans to Get Paid for Their Overtime,” Economic Policy Institute, July 25, 2017. For the likelihood that the DOL will propose a much lower threshold, in the low $30,000s, see “Labor Secretary Nominee Acosta on Overtime: $33K Minimum Salary?” (user-created clip by Tammy McCutchen on C-SPAN, March 23, 2017). For the Trump administration’s deregulatory agenda, see Heidi Shierholz and Celine McNicholas, “Understanding the Anti-Regulation Agenda,” Economic Policy Institute fact sheet, April 11, 2017, and EPI’s Perkins Project on Worker Rights and Wages Policy Watch web portal. 3. The salary threshold does not apply to some occupations, for example, teachers. Teachers are exempt from overtime pay, no matter how little they earn, “if their primary duty is teaching, tutoring, instructing or lecturing in the activity of imparting knowledge, and if they are employed and engaged in this activity as a teacher in an educational establishment.” See “Fact Sheet #17D: Exemption for Professional Employees Under the Fair Labor Standards Act (FLSA),” U.S. Department of Labor, Wage and Hour Division, revised July 2008. 4. 81 Fed. Reg. at 32467. 5. The exemption is in the statute; FLSA section 13(a)(1) says that bona fide Executive, Administrative, or Professional (EAP) employees will be exempt from overtime. The statute delegates authority to the Secretary of Labor to define the terms and scope of the exemption, which is done in the regulations issued by the Department of Labor. For more details on the white collar exemption, see “Fact Sheet #17A: Exemption for Executive, Administrative, Professional, Computer & Outside Sales Employees Under the Fair Labor Standards Act (FLSA),” U.S. Department of Labor, Wage and Hour Division, revised July 2008. 6. Data in this section come from Ross Eisenbrey and Will Kimball, The New Overtime Rule Will Directly Benefit 12.5 Million Working People: Who They Are and Where They Live, Economic Policy Institute, May 17, 2016. 7. Data on number and shares of state workers affected come from Ross Eisenbrey and Will Kimball, “The New Overtime Rule Will Benefit Working People in Every State,” Economic Snapshot, Economic Policy Institute, May 18, 2016. Data on demographic characteristics of affected workers come from Ross Eisenbrey and Will Kimball, The New Overtime Rule Will Directly Benefit 12.5 Million Working People: Who They Are and Where They Live, Economic Policy Institute, May 17, 2016. 8. EPI analysis of 2015 Current Population Survey Outgoing Rotation Group data. The $31,000 figure is the 2004 threshold adjusted for inflation, which Labor Secretary Alexander Acosta has suggested may be an appropriate threshold (see “Labor Secretary Nominee Acosta on Overtime: $33K Minimum Salary?,” user-created clip by Tammy McCutchen on C-SPAN, March 23, 2017). The overtime threshold was last increased in 2004; however, the 2004 increase did not come close to adjusting fully for inflation since the prior increase almost 30 years earlier. If the 1975 threshold had been adjusted for inflation, it would be well over $50,000 today. 9. See the “Minimum Wage Tracker” on the Economic Policy Institute website for a summary of state actions on the minimum wage. 10. Cal. Lab. Code § 515; New York, notice of final rulemaking.